H Li, Zhen Fang*, S Yang, Direct Conversion of Sugars and Ethyl Levulinate into γ-Valerolactone with Superparamagnetic Acid-Base Bifunctional ZrFeOx Nanocatalysts, ACS Sustainable Chemistry & Engineering, 4(1), 236-246 (2016). Acid−base bifunctional nanocatalysts can directly on-pot produce biofuels and chemical from biomass. Particularly, some magnetic metal oxides that are active and recyclable. Mr. Hu Li, a PhD student, co-supervised by Prof. Song Yang (Guizhou University) and Prof. Zhen FANG (Biomass Group, Xishuangbanna Tropical Botanical Garden, CAS) successfully synthesized bifunctional ZrFeOx nanocatalyst for biomass conversions. In their work, acid-base bifunctional superparamagnetic FeZrOx nanoparticles were synthesized via a two-step process of solvothermal treatment and hydrolysis-condensation, and were further employed to catalyze the conversion of ethyl levulinate (EL) to γ-valerolactone (GVL) using ethanol as both H-donor and solvent. ZrFeO(1:3)-300 nanoparticles (12.7 nm) with Fe3O4 core covered by ZrO2 layer (0.65 nm thickness) having well- distributed acid-base sites (0.39 vs. 0.28 mmol/g), moderate surface area (181 m2/g), pore size (9.8 nm) and strong magnetism (35.4 Am2 kg−1) exhibited superior catalytic performance, giving a high GVL yield of 87.2% at 230 ºC in 3 h. The combination of the nanoparticles with solid acid HY2.6 promoted the direct transformation of sugars to produce GVL in moderate yield (around 45%). Moreover, the nanocatalyst was easily recovered by a magnet for six cycles with an average GVL yield of 83.9% from EL. γ-valerolactone (GVL) has been identified as a green and renewable solvent to improve the performance of biomass conversion and various organic reactions, and as an additive suitable for liquid fuels, perfumes and food. More importantly, GVL is able to be employed as a precursor to produce gasoline and diesel fuels (e.g., C8−C18 alkanes and 2-methyltetrahydrofurane) and valuable chemicals such as 1,4-pentanediol and methyl pentenoate, as well as ionic liquids and polymers. Mr. Hu Li, a PhD student, co-supervised by Prof. Song Yang (Guizhou University) and Prof. Zhen FANG (Biomass Group, Xishuangbanna Tropical Botanical Garden, CAS) successfully synthesized g-valerolactone. In their work, a series of mixed oxide nanoparticles were prepared by coprecipitation method and characterized by many techniques. NiZr oxide catalysts and their partially reduced magnetic counterparts were highly efficient in direct transformation of biomass derivatives including ethyl levulinate, fructose, glucose, cellobiose and carboxymethyl cellulose into GVL without using external hydrogen source, producing a maximum GVL yield of 95.2% at 200 ºC for 3 h with H2 reduced magnetic Zr5Ni5 nanoparticles (< 20 nm). Acid-base bifunctionality of these nanocatalysts is found to play a synergic role in synthesis of GVL in alcohols, while appropriate control of Ni/Zr molar ratio is able to improve the selectivity towards GVL (~98%), along with high formation rates (up to 54.9 mmol g−1 h−1). Moreover, the magnetic Zr5Ni5 nanoparticles were conveniently recovered by a magnet for five recycles with almost constant activity. Magnetic nanoparticles: Acid-base bifunctional NiZr nanocatalysts with strong magnetism show high activity and reusability in transformation of biomass derivatives including EL, fructose, glucose, cellobiose and carboxymethyl cellulose into γ-valerolactone (GVL) with 95.2% yield and 98% selectivity. 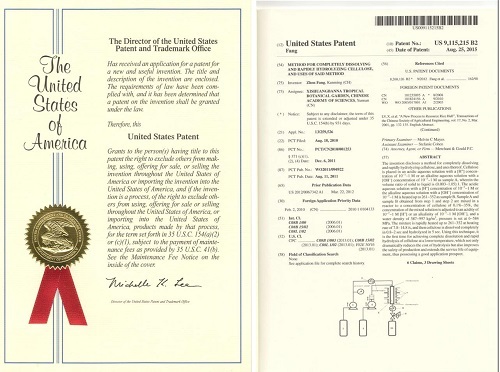 According to USPTO Public PAIR, a U.S. patent #: 9243303 has been issued to Zhen Fang (Kunming, CN) for technology that provides a simple and low-cost method to fast dissolve and hydrolyze lignocellulosic biomass with great potential for a novel biorefinery. The patent entitled “Method for the dissolving and rapid hydrolyzing of lignocellulose biomass, device thereof and use of the same” was issued on Jan. 26, 2016 for work done by Professor Zhen Fang, Leader and Founder of Biomass Group at Chinese Academy of Sciences. Professor Fang stated, “I am very excited to have been granted this new U.S. patent containing such claims that provide protection for ‘fast hydrolysis’ process. In previous work, It was found that by adding 0.8 wt% Na2CO3, actual wood without pretreatment can be completely dissolved upon fast-heating (7~16°C/s) to form a ‘wood solution’ at 329-367 oC at short reaction times (0.7-2 s). The ‘wood solution’ can be rapidly (ca. 15 s) hydrolyzed to sugars/sugar oligomers under homogeneous conditions. Recently, Prof. Fang found that without adding any cayalyst, by putting lignocellulose biomass in pure water and rapidly heated to 330~403 oC, and then 89~99% of the lignocellulose biomass is dissolved and rapidly hydrolyzed to saccharide in 3.38~21.79 s. The following hydrolysis reaction can be carried out under the homogeneous phase condition for the dissolving of the lignocellulose biomass. 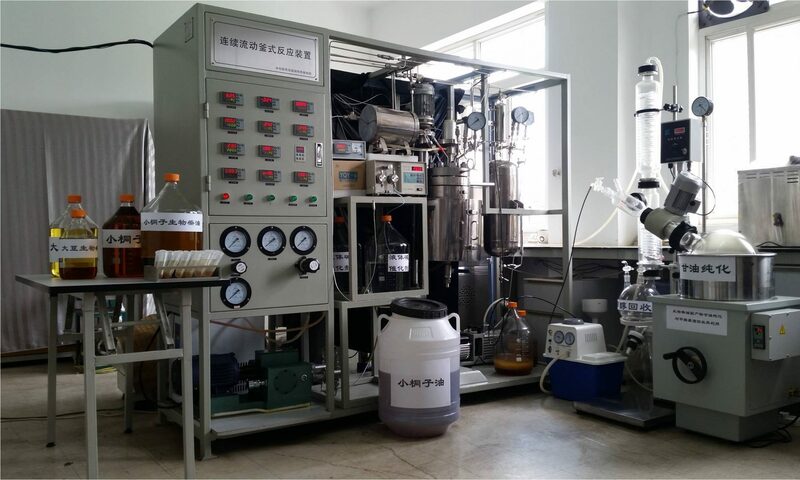 At the same time, the solvated biomass could be easily used in the high pressure flow reactor to continuously pretreat the biomass and hydrolyze for producing saccharide, other biofuel and product. The present invention doesn’t need any catalyst and doesn’t pollute the environment, furthermore the process is simple and the cost is low, and it belongs to green and sustainable industry, and a good prospect of market application could be taken on. The patent is the latest development in a 23-year effort by Professor Zhen Fang in the study of biomass hydrolysis process, aimed at a simple, fast and low-cost method for a novel biorefinery. ‘Fast hydrolysis’ process will be the technological key to economic utilization of abundant lignocellulosic biomass as viable feedstocks for the production of industrial sugar, ethanol and chemicals. His pioneering work opens the door, for the first time, to the possibility of developing industrial-scale technology at competitive cost for producing biofuels and value-added products from lignocellulosic biomass based on the ‘fast hydrolysis’ process in a flow reactor. This patent is the third US patent issued to Professor Fang adding to its portfolio of 19 authorized Chinese patents that cover various features of biorefinery technologies after his returning to China in 2007. Recently, “fast dissolution of cellulose for hydrolysis” invented by Prof. Zhen Fang was authorized US patent (US patent#: 9115215; issue date: 08/25/2015). In the nature, lignocellulosic biomass, such as wood and grass, is roughly consisted of 50% cellulose, 25% hemicellulose, and 20% lignin. Cellulose can be hydrolyzed into saccharides which are further used for producing cellulosic ethanol through fermentation. Because lignocellulosic biomass is water-insoluble, the current industrial methods for hydrolyzing biomass proceed mainly in a semi-continuous percolating reactor containing 0.4～0.8% dilute aqueous sulphuric acid, at temperature of 180～190℃ and under pressure of 12～14 atmospheres. Reports about continuous production of sugars in a high-pressure continuous flow reactor were not found. Prof. Fang invented a method for completely dissolving and rapidly hydrolyzing cellulose, and uses thereof. Cellulose is placed in an acidic aqueous solution with a [H+] concentration of 10-7～1 M or an alkaline aqueous solution with a [OH–] concentration of 10-7～1 M as sample A, wherein the volume ratio of solid to liquid is (0.003～05). The acidic aqueous solution with a [H+] concentration of 10-7～1M or the alkaline aqueous solution with a [OH–] concentration of 10-7～1M is heated up to 261～352℃ as sample B.
Sampe A and sample B obtained from step 1 and step 2 are mixed in a reactor to a concentration of cellulose of 0.1%～35%, the concentration of the mixed solution is adjusted to an acidity of 10-7～1M [H+] or an alkalinity of 10-7～1M [OH–], and a water density of 587～997 kg/m3, pressure is set at 6～584 MPa. The mixture is rapidly heated up to 261～352℃ at heating rate of 7.8～8℃/s, and then cellulose is dissolved completely in 0.8～2 sec and hydrolyzed in 5 sec. Using this technique, it is the first time for achieving complete dissolution and rapid hydrolysis of cellulose at a lower temperature, which not only dramatically reduces the cost of hydrolysis but also improves the safety of production and extends the service life of equipment in a flow system, thus possessing a good application prospect.